Yes, that is big Donncha O’Callaghan you can see at the front of the aircraft. You can always expect a sizeable Irish contingent to make their presence felt in London on St. Patrick’s Day, but they’ll be there in even greater numbers this afternoon. We hardly need to tell you about a certain rugby match taking place at Twickenham shortly before 3pm, one that could end up making history if Ireland end up on the right side of the result against the auld enemy and claim only the third Grand Slam in our history. Plenty of Irish fans have made the short trip east to potentially witness history being made in person and those travelling on an Aer Lingus flight from Dublin to Heathrow were greeted with a special surprise before they landed in London. 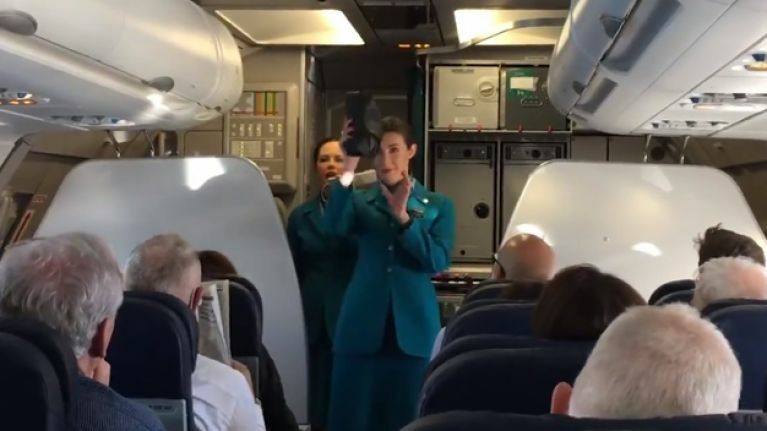 Instead of the usual safety announcement, passengers on board the flight were instructed to reach into the seat pocket in front of them to claim a package containing an Irish rugby jersey, which they were then instructed to put on and not to remove it for the duration of the weekend. Hopefully the pockets of green will be clear to see at Twickenham on Saturday afternoon and if the result goes our way, we don’t think there’s any fear of anyone removing those jerseys until Monday at the earliest.